If you believe the gossip, WPP's Sir Martin Sorrell was on the phone to Sapient Corp's mandarins last weekend making a counter offer for the digital company, which, by Monday morning, had accepted an astonishing $3.7 billion bid to join Publicis Groupe. Cue a predictably amusing exchange of words between Sorrell and Publicis’ Maurice Lévy. Sorrell described Publicis’ acquisition as "the behaviour of a jilted lover" – in other words, a knee-jerk response to the failure of its proposed marriage with Omnicom. He’s got a point. Though Publicis is said to have first held talks with Sapient well before the Omnicom deal was tabled in summer 2013, this week’s purchase certainly seems like a rather hasty second-best alternative. Lévy had to be seen to be doing something; Sapient is that something. Lévy hit back, of course, questioning Sorrell’s authority in matters of the heart: "I don’t believe that’s his area of expertise. If it’s about hatred, it’s an area where he has a lot of talent. When it comes to love, he should leave it to the French." All good sport for us. 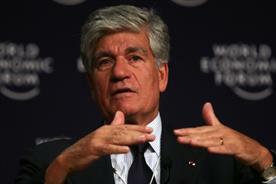 Whatever, the balance of power within the Publicis group has shifted on its axis. Digital will now take a driving seat, and that’s good if you work for one of Publicis’ other digital companies. Not so good, perhaps, if you work for its heritage brands – among them Leo Burnett, Saatchi & Saatchi and the still-troubled Publicis. WPP and Omnicom’s results show that there’s still growth to be found in creatively-led businesses, which Publicis’ digital obsession seems to belie. So at a stroke, the Sapient deal does fulfil Lévy’s ambitions to generate 50 per cent of group revenues from digital, gives him a tangible legacy in terms of future-proofing the company, and brings in interesting and progressive potential heirs apparent in Sapient’s co-chairmen, Alan Herrick and Jerry Greenberg. It also prevents Sorrell or Accenture or anyone else from buying Sapient. But I wonder how much invaluable Publicis Groupe talent it actually disenfranchises, and whether it further weakens Publicis’ creative core.